Click on the badge and play. 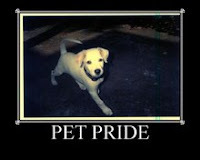 Just by playing, you provide 20 free pieces of kibble to help feed cats or dogs, even if you answer wrong! Please click on here and help--it costs you nothing and takes just 35 seconds to help 6 different causes. Thank God For That White Stripe! Browns Get Comeback Win But at what Cost? 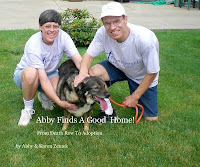 Order Abby's Book--Profits will be donated to Canine Lifeline, Inc. It's time to do our book modeling for our Grab A Book From Our Stack blog header and when I open the closet door do get the treats to bribe my cats, in jumps Manny. He loves to jump up into this linen closet every time I go to feed them. It's a good place to store their food bags where they can't get to them when I'm not home. 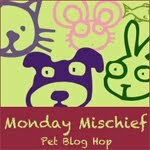 Joining in with Snoopy's Monday Mischief and Aww Mondays hops today. On our morning walk with our dog, Abby, wildlife was abundant! You would think we lived in the woods instead of in a city suburb. 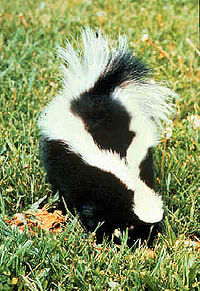 We usually see deer in people's front yards or walking down the street but today we saw three skunks! They weren't all together either, but on three different streets. It made for an exciting walk, I must say. We generally walk from 5 to 6:00 a.m. and in the summer, the sun is coming up but now it is DARK. Fortunately, the skunks have that white stripe which makes it pretty easy to see them from a distance if you are alert and it also helps that they kind of waddle along, unlike the squirrels. They like the dark places so tend to hang out around the bushes, but the one was actually on the street corner. We look forward to when Gerard retires so he can wait until it's light to walk Abby. Abby did good not barking at them and whenever we saw one, we crossed to the other side of the street, doing our best to keep away. It's funny, how much power those little creatures have over us, isn't it? So far we have done well avoiding them. Church was very good Sunday, a good sermon, good Sunday School class with a boy who was new to me joining our class, and an enjoyable Bible study. In the afternoon, of course I watched the Browns-Steelers game that was so fun! The Browns were rolling after the first quarter and it was fun seeing all the fans yelling their heads off. It was LOUD! I am happy and excited the Browns played so well and look forward to lots more wins yet this year. I actually stayed calm through the whole game and wasn't worried they would blow it in the end. The only bad thing was that we had some bad injuries--our center broke his leg so will be out for the rest of the season. 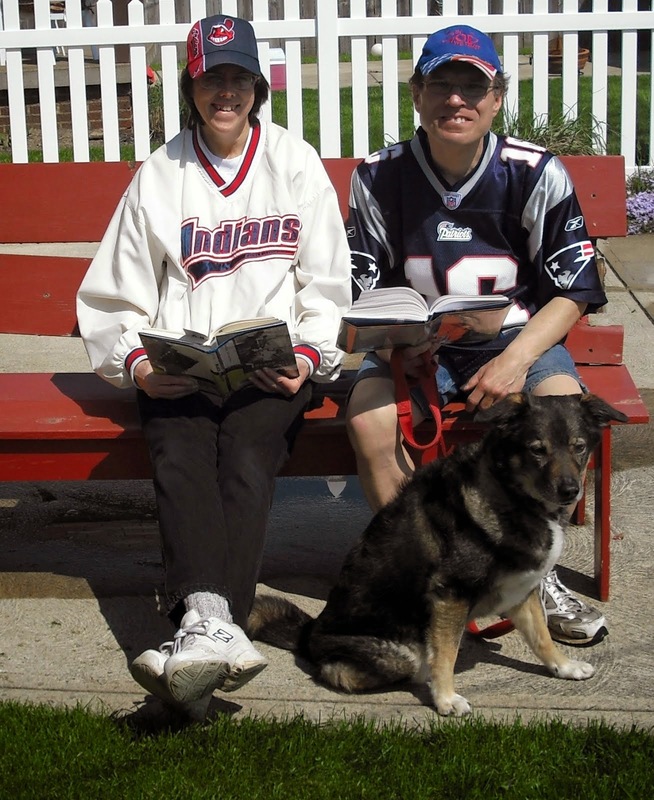 Gerard was happy too because the Patriots won which I think puts them first in their division. Yesterday the Browns set a record for the greatest comeback ever in Browns History and for the greatest road comeback in the NFL! I watched the Browns vs. Titans game yesterday but it was a game filled with penalties, to the point where both teams were getting penalties on the same play so they offset, rendering neither team penalized. The biggest brouhaha came after Jake Locker (the Titans QB) ran the ball into the end zone scoring a touchdown. Our player, Kirksey, hit him in the head with his forearm, making him woozy! Fortunately, he came back in the game after being checked for a concussion. This was unsportsmanlike, and completely unnecessary roughness. To top it off, the Browns didn't even lose any yards because the Titans started fighting sticking up for their QB and penalties offset. Fighting continued after the extra point and on the next kickoff. Later, in the 2nd quarter, Jake was hit on a blitz and taken out of the game. The Browns were behind 28-3 but came back to win 29-28. The Titans didn't score anything the whole second half. I just wonder if they would have won had Jake Locker remained in the game. Players get hurt enough in football just because of the natural roughness of the game. 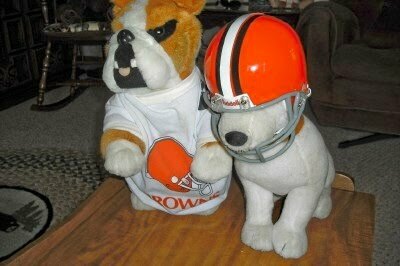 There has to be respect for the opposing team and I hope the Browns do not become a team known for bullying. To me, this win is bittersweet. “Hopefully none of the [the fans] are in the ER right now,” Hoyer quipped. His coach might be headed there, though. I know Browns fans would be in an uproar if things were reversed, and this had happened to our QB, Brian Hoyer, instead. Yet in the coverage, it seems this episode is being completely overlooked. From the players celebrating in the locker room, to the post-game interviews with the head coach, to the Twitter comments from Browns fans, no one even mentions this. I seriously hope this kind of behavior does not fall into an acceptable "just part of the game" category. Intentionally hurting other players should NOT be "part of the game." Friday Fragments is hosted by Half Past Kissin' Time for bloggers to post a list of short things on their minds that aren't really enough for a whole post. I always liked eagles and thought they were very cool birds until last Friday when I read how eagles eat cats in Reflections by Kathy's Friday Fragments. Sorry eagles, I prefer cats to you. Today is World Smile Day according to the morning news show so smile and see if you can make someone else smile today! I hope this post makes you smile. Spunky and Manny's favorite was Posey, a picture book about a kitten. Click the links to see our reviews on our book blog, Grab a Book from Our Stack. Monday we finally finish our bit-by-bit window replacements by getting new windows from Pella in our main bathroom and upstairs bathroom. I had to have bubble wrap taped up over them to keep the cold out. The main bathroom actually gets ice and snow on the inside during the winter! No more, yea! This makes me smile. I am enjoying participating in another Beth Moore Bible study called "Children of the Day" on the books of I & II Thessalonians. She is so good at applying the scripture to our life and using many funny and interesting examples from her life. This is what makes her such a good speaker. I'll end with a little joke to try to get you to smile: Why was 6 afraid of 7? Because 7 ate 9. Monday Mischief – Sorry, mischief strikes!